The Minister of Economy, Trade and Industry, Patrice Minors, today [July 30] formally opened the St. George’s EEZ Office. The Minister also took the opportunity to announce Mr. Raymond Lambert as the Economic Development Officer for the St. George’s EEZ. He will assume the post in early September. Minister Minors said, “This new St. George’s EEZ Office will be an extension of the BEDC Church Street Headquarters and the two other EEZ branch offices in North East Hamilton and Somerset. “For St. George’s stakeholders this will be the venue where they can come and get all the information and support they need in order to prosper in the St. George’s EEZ. “Most recently, two new retail stores opened adding diversity and variety for both east end residents and visitors. Last Night, a lingerie boutique and The Cave, a menswear retail store opened next door to each other on Duke of York Street and have been creating a buzz ever since. “The St. George’s Indoor Market, which houses 5 new businesses in a collective, opened on Water Street just a few weeks ago. “Providing a range a products from candies and baked goods to jewelry and clothing, the Indoor Market enhances the consumer’s experience of vendor markets when the now established Olde Towne Market is in operation on Saturdays and provides another retail choice when the market is not running during the other days of the week. We are here to mark yet another milestone for the Economic Empowerment Zone (EEZ) initiative. Friends of St. George’s, the Bermuda Economic Development Corporation (BEDC) with the Ministry of Economy, Trade & Industry and our stakeholder partners have been and are working as agents of change for the entrepreneurial community in the east end. This new St. George’s EEZ Office will be an extension of the BEDC Church Street Headquarters and the two other EEZ branch offices in North East Hamilton and Somerset. For St. George’s stakeholders this will be the venue where they can come and get all the information and support they need in order to prosper in the St. George’s EEZ. The EEZA has been working tirelessly with stakeholders and entrepreneurs in the east end to make key connections for the Town and surrounding areas, to facilitate and support new and existing entrepreneurs and to match entrepreneurial opportunities and gaps with those who can fill those gaps. These collective efforts are bearing fruit as the SGEEZ regenerates itself. Most recently, two new retail stores opened adding diversity and variety for both east end residents and visitors. Last Night, a lingerie boutique and The Cave, a menswear retail store opened next door to each other on Duke of York Street and have been creating a buzz ever since. Vendor markets, whether enclosed or outdoors, provide another opportunity for micro-enterprise to occur. The St. George’s Indoor Market, which houses 5 new businesses in a collective, opened on Water Street just a few weeks ago. Providing a range a products from candies and baked goods to jewelry and clothing, the Indoor Market enhances the consumer’s experience of vendor markets when the now established Olde Towne Market is in operation on Saturdays and provides another retail choice when the market is not running during the other days of the week. 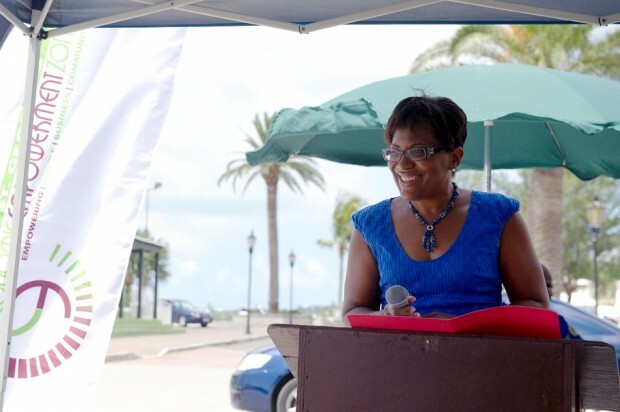 BEDC and the EEZA are proud to continue to partner with the Olde Towne Market in supporting their efforts to revitalise the Town and offer a viable historic atmosphere for vendors to work their small businesses. Surprise! a scrapbooking store opened this year providing a noticeable presence on the Town Square while finding its place within the arts and crafts marketplace in the east end. Likewise Triton Tattoo on Water Street opened a couple of months ago and has found a niche market through providing an alternative art form in a traditional historic setting. The Tattoo shop also doubles as an Art Gallery showcasing unique local artists works. The regeneration we are seeing is not just limited to retail. In the restaurant sector, a few months ago Sweet P opened its Tea Room partnering with the Bermuda Perfumery. Last week, GoJo’s Coffee Shop right on the Town Square had a soft opening next to the bustling Visitor Information Centre. And last, but certainly not least, Tamasun’s Japanese Restaurant at the highly visible junction of York and Kent Streets is preparing to open mid-August. I look forward to hopping across the bridge to sample the sushi. The examples I have highlighted indicate that more and more entrepreneurs are looking to St. George’s and the east end as a viable place to set up business. The fantastic thing about all the new businesses I’ve mentioned is that they are providing services and products that do not just cater to the visitor market – they are serving locals. It is encouraging to see that many business owners in St. George’s are capitalising on the untapped local market and creating business models that will allow them to serve a thriving local population as well as the visiting tourists. The SGEEZ recognises that this approach can help to ensure that more businesses succeed. What is even more encouraging is to know that the entrepreneurs in St. Georges are not waiting on Government but are empowering themselves with the recently formed, St. George’s BDA, that is St. George’s Business Development Association. The organization is developing great plans for the various target markets to assist the town’s businesses to re-energise, re-vitalise and enhance the business activity in this beautiful historic, World Heritage Site. Mr. Henry Hayward and the committee chairs, Mrs. Michele Wales, Mr. Jan Card, Ms. Kristin White, and Mr. Mark Soares and the participating businesses are to be commended for their efforts and the EEZA is ready to assist and support the planning and development of the initiatives that are being planned as required. There is visible regeneration occurring amongst St. Georgians themselves as they strive to change the dynamics of their local economy. More east end opportunities await those entrepreneurs willing to take the risk. The St. George’s EEZ Office is here to assist and will be staffed by an individual who is knowledgeable about entrepreneurship and what it takes to be successful. I am pleased to announce the appointment of Mr. Raymond Lambert as Economic Development Officer for the SG EEZ who will take up the post in early September. Mr. Lambert has over 20 years of professional and entrepreneurial experience having most recently owned various entities such as Windjammer Sailing School, Windjammer Water Sports, and Windjammer Enterprises, and then successfully managed Snorkel Park. Having a great deal of experience in the marine industry, we believe he will be an asset for St. George’s as we look to leverage the asset of the waterfront and its marine opportunities. He will offer information on the process of setting up a business, work with community stakeholders, as well as offer information and support to those that live in the area through opportunities for property improvement and self development. Ultimately, it is our hope that when individuals leave this office they will feel supported, will have learned something new, and will feel a sense of empowerment to become masters of their own destinies. In closing, thanks must be given to Mayor Bascome, the Corporation of St. George’s membership, Mr. Courtney Trott, Corporation Secretary and his team for renting and readying this space and making this opportunity possible. Again, we encourage the St. George’s community to use this EEZ Office to the fullest and to those present, thank you for joining us on this most special occasion. 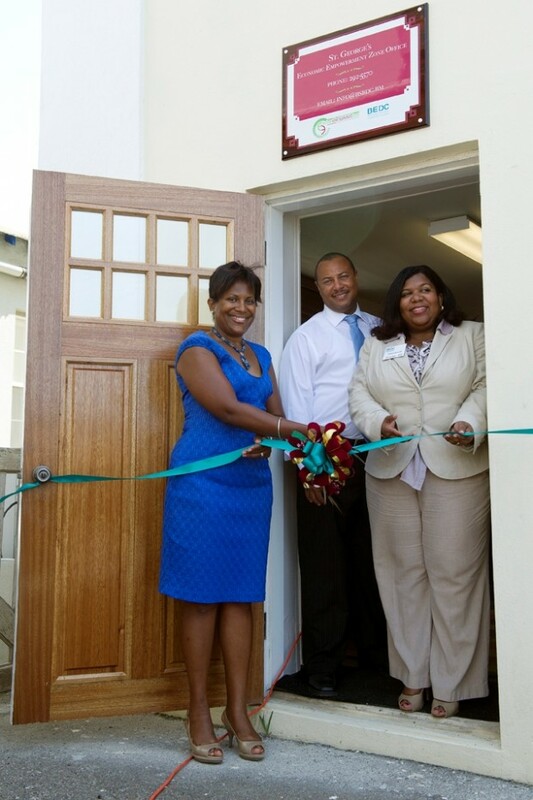 The Economic Empowerment Zones Agency, a unit of the Bermuda Economic Development Corporation, is now proud to open its St. George’s office. I’d now like to turn this part of the proceedings over our EEZA Director, Mrs. Erica Smith who will say a few words and introduce you to Mr. Raymond Lambert, incoming Economic Development Officer for St. George’s. Patrice…..is this what you think your supposed to be doing for a living? Is there really a need for offices in Somerset and St.Georges? What will the staff do daily, as it is unlikely that more than two persons will need this service weekly. Oops, I almost forgot,there is an election on the horizon,and the Government has truckloads of money—right?